Antiques experts Paul Laidlaw and Margie Cooper make their way across the country for a penultimate auction showdown in Llandeilo. Look at that, come on! Is this the Bristol Channel, or is this...? -It is the Bristol Channel. -This is as good as Cornwall. until the last auction, that is. rather eclipsed Paul's trademark militaria, for once. -I'm being bombarded with boring old military bits. That fetch tons of money! I get enough of boring military when I'm at home, thanks very much. I'll be blowed if I'm having it in this car, Margie. so far increased that to a very respectable £333.78. with £451.64 to his name. Perhaps a semblance of home advantage, eh? You are in the car on a road trip with a Celt. -Oh, no, not in Cheshire. We don't have Celts in Cheshire. and end up at a Carmarthenshire auction at Llandeilo. Victorian resort known as The Garden By The Sea. after tying the knot at a Cardiff registry office. He painted half a dozen oils during his stay, too. -So you're off to your shop. -I'm off to make my fortune. -Very well, good to see you. I'm Paul. -Gitty, it is a pleasure. get our Paul excited and mischievous. given Margie's great success in the last with such. Eh, I don't think so, Paul. Just like that Ruskin brooch is not for you. This is more like it. and we have various scrolls and legends. "Presented by HRH The Prince Of Wales November 1887." What on earth was going on in Dominica? which was merged into the Duke of Cornwall's light infantry in 1881. I don't know much about it at all. It came out of a local house. It's a pretty thing - is it dear? Have you got high hopes for it? -Or is it reasonably priced? He's clearly intrigued, but for £85 not yet convinced. -Dare I ask what's in the basement, then? You name it, it's down there. What red-blooded antiques expert could ever resist a trip to a dark cellar, eh? It could be where the treasure's buried, after all. I've only got so long to spend here. I hope it was worth his while. Paul Laidlaw, antique hunter - a bit like Indiana Jones in tweed. Is it made up by a wood turner with no great talent? Is it someone's O-level woodwork gone horribly wrong? Or is it something out of Africa? I need it to be old, and not just tourist fodder. 20th-century tourist fodder. What am I looking for? A hallmark of some age. but I've got a killer for you, here. Yeah? Not modern felt, old baize. "I don't want it scratching my polished wooden floors"
and they tacked on some green baize. I assure you, that's not modern. Well, it was worth all the cobwebs, then. What's not to like. Sweet! was one of the most important women in British pottery. Her motto was "elegance combined with utility". I see a price tag. I do, don't I? Is this going to be cheap? It's £125. She's got 1930s, do you think it is prewar? I'd like it to be. It's too much money. Oh, hopes built up and dashed. I think it's worth £40 to £80 at auction. All I can do is ask the question. -Are you still alive down there? Time to emerge, blinking, into the daylight to talk to Gitty. Can I ask you about this? I thought I'd found something. but you've got a Susie Cooper complete coffee for six there. I can't find the coffee pot, at the moment. A coffee set with no pot! That's why it was down there, then. -it's got a prewar number. -You see, Gitty, you're selling it to me. -What's the price on it? Well, how about if I let you have the lot for 60? It's a hell of a discount. -But I'm going to say can you make me 30? Sorry. That's pushing, pushing your luck a bit. -40, which is the compromise, but there's a "but" here. -Throw that in with it. He's got the ethnographica for next to nought. But what about the mysterious militaria? You have got to buy my picture. You're not going out without that! In theory, it is dead easy to sell me that. no-one else is going to care. Down in Cornwall, it's a flyer. Yeah, Llandeilo, in this case. It's a strange thing to sell in South Wales. -I'd pay 20 quid for that. -No, I can't do 20 on that. -I'll do 40 but I won't do 20. Hang on, this isn't over yet. We're only having a ceasefire. -You know you've got me, don't you? -I'm like a little fish, a little hook in there. I will gamble on it at 30 quid, if you can sell it for that. -That's fine. I'll sell it for 30. -Gitty, we've bought three things. Marvellous, that's what I like to see! I told you I'd thin this place out. That's £70 for three auction lots. ..and a fantasy castle in the woods. Thank you, I wish I could respond. But I can't. -My word! What a place! 3rd Marquess of Bute, and his architect William Burges. -Many people think this is a sort of Victorian fantasy. you can see there is a distinct change in colour in the stonework. -and what's above is from the middle of the 19th century. and towers were added through the 12/13th centuries. It was an important little castle in the Lordship of Glamorgan. What's that red thing there? and it's part of the Victorian recreation. to drop missiles on anyone trying to get through the drawbridge. The Marquess of Bute and William Burges, they loved this sort of thing. They loved playing at the Middle Ages. This whole castle is a bit of fun. and architect set about creating a sort of medieval utopia. favoured traditional craftsmanship over mass production. We're in the banqueting hall. -This is the main eating room, the table's in front of us. while William Burges was alive. He died in 1881. Oh, so he never saw it finished. but he saw this room finished. And it's in his favourite Victorian Gothic revival style. had been doing in the Houses of Parliament, for example. with Lady Bute's bedroom amongst the most fabulous interiors. It's a sort of allegory of the world. we are surrounded by the flowers of the field in this nice panelling. And then we can see the animals, these are Aesop's Fables. and finally the sun in the top of the room. because these are the three Fates. You've got childhood, the prime of life and old age. And the three Fates are spinning the thread of life. And ultimately, the one on the right cuts that thread and our life ends. but sadly, the Marquess also passed away just a few years later in 1900. From the early 20th century, it was hardly used at all, if ever. so the Army were living here. -I'm told they used to have dances in this room. and he sold up his estates, most of his estates here in South Wales. Thankfully, Castell Coch is now owned by the Welsh people. So we can all appreciate what was once the Marquess's country retreat. also given the Victorian high Gothic treatment by William Burges. Or, like Paul, you can just pop into the antique centre. Folks. Margie after a bad auction. Margie trying to solve her problems. Margie now, after a good result. Well, there's something concrete for you. -You look in charge behind there. -I am Sue, yes. Hi. Lovely to see you, I'm Paul. Welcome to the Pumping Station. Amazing, isn't it? It looks like you've managed to fill it. Oh, yes, we're very full. Paul can afford to take his time and be choosy here. He's had a good morning, after all. God, that is cheap. I don't know if I want it, but it's cheap. in 1948, with the RAF. Margie's arrived and she may feel a little differently. She's never been a fan of the giant antique centre. She prefers the personal touch. I do hate it when the dealers aren't here. And it's a bit late in the day too. So just getting her hands on some of the stock could be a problem. You always want to go places you can't go, don't you? Breathe, Margie. Something will turn up. Just don't worry about Paul. He's in here somewhere, isn't he? Lordy! He certainly is. And he seems to be interested in something. We have a clock garniture here. A figural clock garniture. in chains. And what's he doing? Surely he's trying to break his chains. the flanking elements of the garniture. The other one, this chap here, lost his chains. Looks like he's launching a brick. Is he breaking down the walls that make him captive? Surely they represent liberty from slavery. The origin, I think, is German. that comes about in Austria in the very late 19th century. in German-speaking and Scandinavian countries. It's unusual and I like unusual. It's complete and the condition is good. -And the clock doesn't work. What do we have here? The trio, £97. If you want it, it's no money. If you want to sell it at auction, it's way too much money. Margie, meanwhile, is also looking into something. It's just an attractive gilt mirror, isn't it? With that nice bit of hand-painting there. Gilded gadrooning, bet it's early 20th century. I think that's quite attractive. -Not the price, though, is it? Right, let's put it back. There's only one way to find out if it can be any cheaper, Margie. so maybe it would attract somebody else. I will give the tenant a ring and see if I can do anything better. -See how much they want. -Normally, they do tell us 10% on it. a slightly bigger reduction than that, Sue. but the lady wondered whether you'd be able to move any more on it. Back to Paul's clock. Adrian is trying to get him a deal on it. 49 is the absolute best, is it? 49 is so close I can smell a deal. 45 and I'll buy them. Say 45 and he'll buy them. -Tell him he's a good man. Another deal for Paul. But no such luck with Margie's mirror. and that was still a little high for her. It's very nice, but 55 is a gamble, isn't it? I think I'm going to say no to that. Time's up and Margie's funds remain untapped. Not that she seems too bothered about that. Do you like the country or the seaside? Er...both, but the seaside first. Well, we never thought they were like peas in a pod, did we? about what her fellow tripper has been up to. -How's it going for you? I have bought a handful of things. I'm still shopping, but I don't feel under pressure. Yourself? Gulp! Margie didn't get a single thing yesterday. Which means she has lots to buy and £333.78p to buy it with. and a piece of militaria, all snapped up. leaving him with over £336 still in his wallet. No wonder he's happy to be driving Miss Margie. I've got this man, I think he's Pict or a Celt or something. Don't understand a word he says, but he gets from A to B. Later, they'll be landing up at an auction in Llandeilo. But our next stop is in Carmarthen. in Cornwall and visited Tintagel where some say King Arthur was born. in a cave, of course. -Right, have a great day. Shop till you drop, Margie. singer in Eurovision winners Brotherhood of Man. I'm sort of getting an old hand now at this Road Trip. I think you'd probably have had to stretcher me in. And this looks just the place to break that duck. -So you're going to be my helper. -Right, so what goes on in here? -We've got 40 dealers altogether. -So you've got jurisdiction to maybe deal a bit? Everything is negotiable. OK? Everything is negotiable. Just what Margie needed to hear, I'm sure. Sounds like those two are already in tune. It's got three handles, which are sometimes called a tyg, T-Y-G.
Then you've got a little two-handled mug. It's like a loving couple really. First chance now for a bit of that promised negotiability. -How much are the pair of those? -I can do the pair for 40 for you. -As good as her word. -I've got to say yes to those. Off and running, Margie. Or should that be marching? Oh, look at my soldier. I've been with my soldier boy all week. It's Paul Laidlaw, this, isn't it? I'd just love to buy it for a laugh. -He looks a bit younger than Paul, doesn't he? Trouble is it's £95. Tinplate mechanical toy by Marx. Marx was a very successful American toy manufacturer. Founder Louis Marx was known as the Henry Ford of toys. -How much could this be? This time, Viv needs to call the dealer. It needs to be cheaper. Right, I've spoken to the dealer, 65 is his best on it. -He's selling on behalf of someone else. I can't see me losing on that. I just think he's OK for 65, I really do. Oh, yes, I've got to have him. Go on, I'll have you. where's our other little soldier got to? Driving from Carmarthen down to Tenby, that's where. The town's Welsh name translates as "little fortress of the fish"
it was an important settlement long before it became a seaside resort. But Paul's in no position to pull up a deck chair just yet. Not with shopping still to do. Johnny to his friends, Paul. Nice shop too. Worth your usual close inspection. I've got my eye on you, Cooper. Yesterday, there was no coffee pot. What is it today, I wonder? We're missing the sugar basin, aren't we? Maybe not. There's sure to be something else. Certainly quite a bit bigger than the last one. This is rather a smart grandmother clock, we'd call it. Which is a short longcase clock. Brass-faced with a silver chapter. It's in the style of the mid 18th century. However, I think it was probably made in the 1920s. And it's priced at £150. However, the movement is faulty. so much money on a broken clock? Johnny? Step into my office. -What are you like with prices? Are you a man I can haggle with? What have I got on the ticket on the clock? I'll sell you the clock for 105. Time to take five minutes. Not that our clock will be much use for that. I want the clock. But it is a gamble. If I'm right, I might be able to get it sort of working. If I can, then not only will I buy it, I'll be happy about buying it. What do you think of that, eh? We've got a working timepiece. Well, we have to hand it to you, Paul. Let's hope the price doesn't go up again. -You've got a deal, so thank you very much. So, Paul is the proud owner of a working clock for £105. Has Margie continued her fine start to the day? I've seen something in here if it could be reasonable. Yeah. A little Art Nouveau job. It's just got a right feel about it. For use with miniature cups, perhaps? We think it's a calling card tray. -Your butler would come along and introduce it on that. the cow isn't coming up to her and he's just sneaking up behind. What are we getting into here? but I'm sure Margie will be keen on a reduction. That's got to be cheap and cheerful. I think Viv's got the message, Margie. -I was really thinking about 10 quid. I know what I bought it for. You can have it for £10. Oh, Viv, you're too good to me. Margie's still on the hunt for more. I like this. I think it's a pastel. I think it says here 01. Could that be 1901? That is a really good sketch of a horse. And he's such a toff, look. That guy's just got attitude. and was very fond of rural scenes. Oh, crikey! It's over 100 quid. This could be Viv's greatest challenge yet. -Have you got a minute, Viv, darling? Yes, lovely, there's a lot of interest in that. It's just come in. -Has it just come in? -There is some room in that. -We can go down quite a bit. What are you thinking of? Where do you need to be? Please don't ask her that. -I can be round about 50. If you shake my hand at 40, I'll have it. -Yeah, go on. Go on, go on, you've done well. All they've got to do now is get it off the wall. -Plan B, if you hold that. -It should be. Hang on. We've just got one problem here. You want to swap? There we go. That was some shop, Margie. Five buys. Now, time to pay up. I don't know. I don't know, I haven't got a clue. I'm not surprised after that flurry of activity. But will her little haul get Margie back in the game? It's all down to the auction now. I'm not blaming me. Blame the auction. But in Tenby, Paul has also finished shopping. You could say he's clocked off, in fact. the inventor of a little something it's hard to imagine doing without. what during the late Middle Ages was the biggest port in Wales. was undoubtedly the mathematician Robert Recorde. -going on between different merchants. That maybe is what sparked off his interest in mathematics. he was both a doctor and an author. all those sorts of things had been written in either Greek or Latin. remained in print for over 150 years and was reprinted about 45 times. mathematics to a complete amateur. maths was known only to a fortunate few. and learning it had an advantage over his competitors? a kilderk or a "barrell"
and it contains 9, 18 or 36 gallons. Herrings... A butte, a barrell, a bar, a firkin, and so on and so on. when you're trading, so this was a really important step forward. his most lasting contribution - the equals sign. and to avoid the tedious repetition of these words, "is equal to". You can tell how fed up he was! "Because no two things can be more equal. "And now mark these numbers." And that's the very first use of the equals sign. were writing, don't forget, and using other different symbols. became the universal symbol for equality. Robert Recorde died at a debtors' prison in 1558. I did more than my fair share of maths at university. this man of Tenby came up with the equals sign. I'll do my bit and spread his name. let's see the sum of what our two have bought. and a clock garniture for £220. and a picture for £155. Margie is looking good again, looking strong. Yesterday's news! Dull, but profitable. and he's managed to get it working! That could be a bit of a worry. £10 paid, but if there's any justice in the world, that's a struggle. He's £100 ahead, which is not that much, really. But I think I'd put money on Paul Laidlaw! -Can you hear that noise? Can you hear that? Sounds like a clock ticking! is named after St Teilo, who was a contemporary of St David. For almost 800 years, they hosted an annual fair in the churchyard here. -They say there's an amazing clock in the sale! and the auction's not online, either! Listen carefully to what auctioneer Michael Jones makes of it all. I think the clock is a bit messy, it's been worked on. -Lovely cups I'd use myself. Might get £20 for it if you're lucky. I wouldn't want in the room. If they think they're going to make a profit, they'll be lucky. What's more, they seem to be having a bit of difficulty with his accent. When he's talking to the people who are bidding, he talks in Welsh. -I thought it was all Welsh! There's English in there as well? Margie's little soldier leads the charge. I go straight in, a bid of £20, I've got, 20, I've got. £20, I've got. Any advance on £20? 22, 24 now on my left. 24, 26 back here. 28. -I'm having a job to understand. -Don't worry, Margie, it's all bad. -Any advance on £30? 32. Back in at the last second. 34 back here. Selling at £34, then. A shocking start, but our two don't seem to have quite got it yet. -What did Lot 170 make? -YOU bought it? He BOUGHT it! Hopefully, they'll be a bit more on the ball from now on. Paul hates it, but that's no reason for it not to make a fine profit. -It's got a tenner straightaway. -12 now, 14 is there. 14 you've got, 16, 18. Selling at £18, all done? Cheap enough, selling at £18, all done. Sold. -You've got to be happy with that, holy Moses! Goodness gracious, I'm sure she is! Just wait till your lots come up! I'm worried now. I'm the guy that went in heavy. Paul's coffee set without the pot, there. I've got a few bids here, 15, £20 I've got. 22 now, any advance on 22? -22 it is, then, selling at £22, 24. 26 back there. 26, I've got. Go for it, don't be daft! Go for it, don't be daft! No, a bigger loss after auction costs, though. The lucky winner just needs a pot, now. Time for Paul's bit of Jugendstil. I've got 35, 40, 45, I've got. 45 I'm bid. Don't know about cheap enough. Too cheap. 55, here, that gentleman there. Any advance on 55? It's cheap. Selling at £55, then - all done? It's a profit, love. Chuck! Margie's Worcester tyg will do the trick. You're going to make money on these, aren't you? Did I say that with sufficient menace? 12 here, 14, 16 here. 18 I've got. 20? 22, 24, 26, I'm out. 26 I've got. Any advance on £26? Selling at £26. -Can her loving cup do any better, though? -I've got 10, £15 I've got. 15, 17, 19, 20. 22. 24 is there. 26. 26 is out. Any more? Both gone for 26 quid! So, neither of Margie's cups runneth over. Just be grateful you didn't spend £105 on something! I'd have high hopes for Paul's militaria. -This is the best thing in the saleroom. £10 start it? Anyone £10. 12 here. 14 behind you. Nice one. All done, selling at £14? £16. A rare reverse for Paul's stock in trade. But a bargain for someone! We're taking a bit of a hammering here, aren't we? Paul was a bit worried about this. Straight in, I've got a bid of £40. I've got 50 back here. 55, 60 here. 65, I'm out. 65 I've got. Any advance on 65? Don't knock it, Margie - it could be the profit of the day. Margie, the leg's gone. It's off. Your clock suddenly looks like an even bigger gamble. 100 quid? 50, then? No. £20? -Where do you want to start? £20, I've got. -Any advance on £20? No? £20 it is. You're kidding me. It's the price of a mantel clock! It's the price of a mantel clock! 40 now. £40 I've got. You're getting there, you're getting there. All done? £40. 45. 45 there. -I think you lost money there! -Aww, there's no justice there. -You've gone a bit pink! But that gigantic loss means Margie is firmly in the lead. Margie, Margie, Margie, I'm losing it! I'm losing it! Maybe your African stool might pull you out! Yes, that can't fail, surely? I've got five, £10 on that. £10 bid I've got, 15 now. Selling at £15? All done. 20. 20 now. 25. 25 I've got. Still cheap, but I'll take it. Selling at £25 then, all done. Selling at 25, last chance. 27. -Give it another hour, he could make 50 quid! Not exactly a big finish, but at least it's a profit for Paul. -Not enough to beat Margie, who will be the winner today. leaving him with £376.78 to spend next time. made, after paying auction costs, a loss of £16.42. and is less than £60 behind. because I don't want others to see that I've been crying! Have I won an auction? Have I? Will you stop going on about winning this auction?! I'm going through hell in here! Look at this! I could do this all day, I'm in my element. -And how not to make a bean. 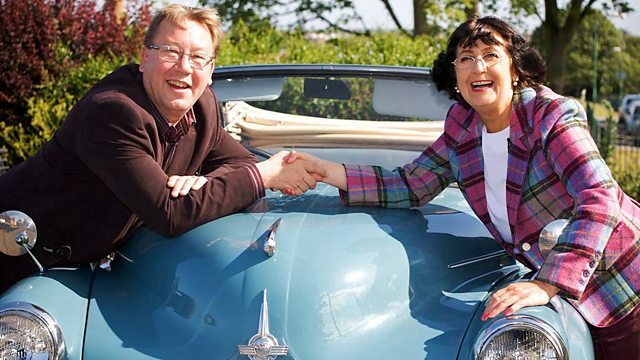 After a very successful auction, antiques experts Paul Laidlaw and Margie Cooper kick-off leg four of their road trip in south Wales, and make their way across the country for a penultimate auction showdown in Llandeilo.